After a few months of hard work we are pleased to announce a new version of our Probe API. We decided to completely rewrite the API specification to apply all the things we have learned over the last few years without breaking API access for our existing user base. We don’t plan to sunset the old API version yet, but new clients are not able to sign up for the old version. Our API is well documented including a Quickstart guide which will get you up to speed quickly so you can start running your measurements. We have learned a lot of lessons over the years about how to make the API more scalable . We are pleased to say the new API already supports millions of measurements running every day! As part of new API release we are offering access to our Android probes to all of our users. API users can leverage increased coverage by testing on all available platforms, or specifically target mobile probes using Platform source targeting. We will soon have an announcement about hardware probes which will be supported in the same way, without the need for code changes. Being a small company, we have always taken personal care of each client and made sure our support team provides expert advice on internet performance measurements to assist clients in fulfilling their goals. Our API access starts from 49 EUR per month. Please check our pricing here. Our new API offers many more options on how to select probes for measurements. Our users can select probes by location (e.g. City / Country / Lat and Long coordinates), network (Network name, ASN or IP prefix) and more. Using ProbeInfo properties API users can specify what information about the probe is useful for them to return with the measurement results. We have added new properties such as DNS Resolver IP, Screen size (useful for page load tests), User connection type and more. 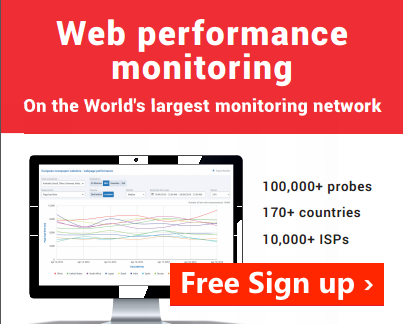 Our API supports existing measurements such as Ping, DNS, Traceroute, HTTP, Webpage load. We have also added a new measurement type – video streaming test. We added an option to run TCP ping. DIG command now responds with full DNS query information . We now have available metrics such as TTFB, TotalLatency, DownloadedBytes, TCP connect time. HTTP GET measurement can also return full HTTP Headers and Body. 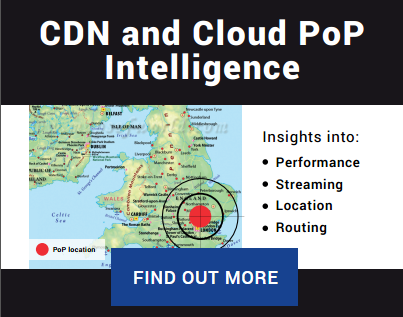 This can be very useful for many scenarios such as finding out which CDN POPs are being accessed, CDN cache HIT/MISS analysis, keyword monitoring in the HTTP response. The possibilities are endless! We offer all the web performance metrics you would expect and we have added a couple more: such as the number of requests the page has loaded as well as full HAR file. HAR file is very useful in getting a complete picture of the pageload performance and allows you to construct a waterfall model which we use in our CloudPerf product. We hope all the improvements we have made will encourage you to sign up for our 7-day FREE trial.